In this workshop task you are asked to create a mechanical* montage of yourself and one of a close friend or relative. This montage should seek to be all that a passport photograph is not – something which tells us of the complexities of identity rather than attempt to provide neatly packaged information for digestion. *Mechanical montages are made with paper and glue rather than with digital software – allowing a less linear manner of working to take place. Scan the montages afterwards to share online. The Identity Project, started in 2014, is a project which aims to explore the labels that we chose to identify people with to do with trying to define gender and sexuality. 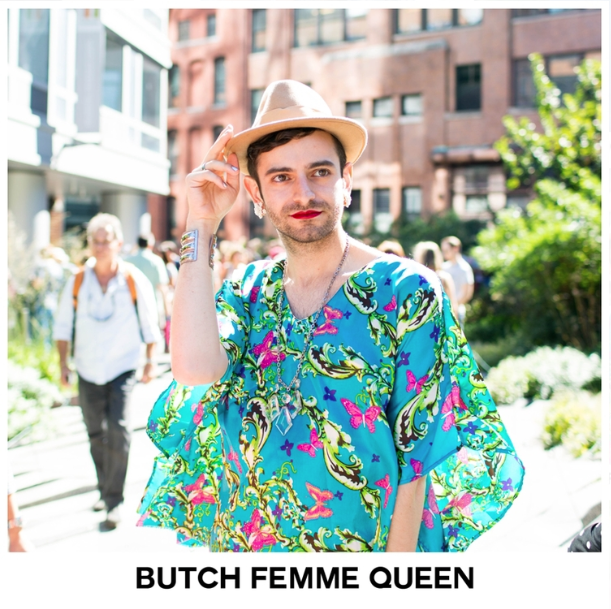 It started when the photographer put a picture of herself, entitled ‘Queer Femme’, on Facebook and then called for participants for the project. The photographs, although minimalistic and a bit generic, challenge how we think about people and make the viewer think about how we label people because of how society thinks of them. The aesthetic of the images reminds me a lot of the features you see in magazines where trend spotters will stop people on the street, ask them about what they are wearing and photograph them on the street. This, I feel, makes the images relatable because people are used to seeing these kind of photographs in everyday life. However, what sets the images apart is the accompanying text that allows us to see how these people label themselves or have been labelled by society. This again makes us think about why we create these labels, what characteristics of the people cause us to make the labels and what makes us think that we can give people these labels. I think that because we aren’t used to seeing these labels along with the images, it grabs our attention and makes us look which then leads us to think about it more than we would if it was just the stand alone images. 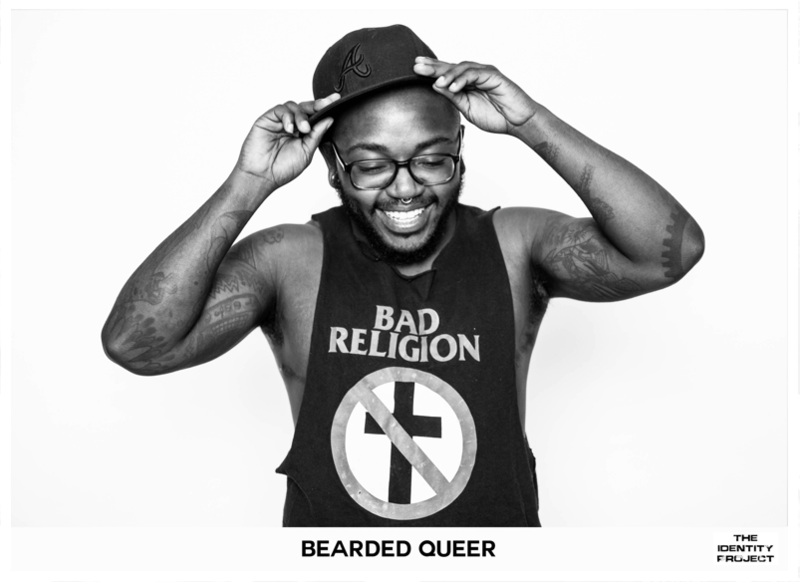 The images, a mixture of black and white and colour, show different people who are all labelled differently, along with the labels that they have given themselves or have been given by society. The labels these people have given are technically part of their identity and I think that this project allows us to challenge what these labels do to these people and how it affects them. For example, do they adhere to the rules that come along with these labels or do they try to act as if they don’t fit into the labels so that they don’t get perceived as being part of something that society has tried to form them into? Do they like these labels? If not then why not? Do they find it offensive or do they like being given these labels because it means that people have noticed them? I feel like this project could be extended into so many different forms of identity and not just about gender roles and sexuality because there is such a broad spectrum of elements that make up our identities. This would enable us to think about how we label people not only to do with their sexuality but also other things like their race, political preferences, etc, as this would mean that we get a better understanding of society and not just the LGBT community. The images on the website, as seen above, are laid out in a grid formation which is I think a way of showing all of the people as being equal no matter what label they, or society, have given them. This looks at not only identity in the sense of how society sees people but also in how we see ourselves and our ‘tribe’. 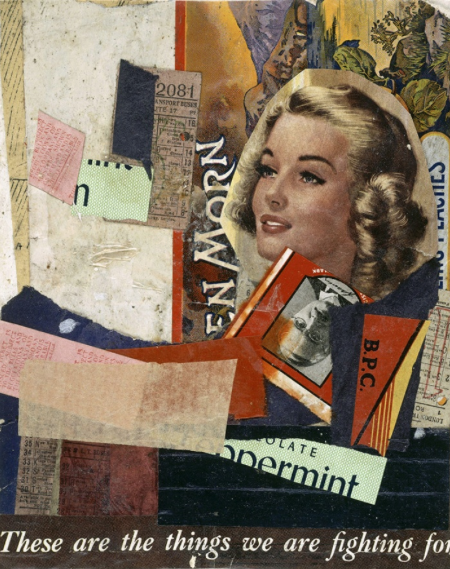 Kurt Schwitter’s influential pieces are considered some of the most beautiful and accomplished collages of the 20th century, according to The Guardian. The artist was a key figure in European Dadaism, the group that invented the concept of Merz; which is the combination of materials for an artistic purpose and is something that has been adopted by many artists since. 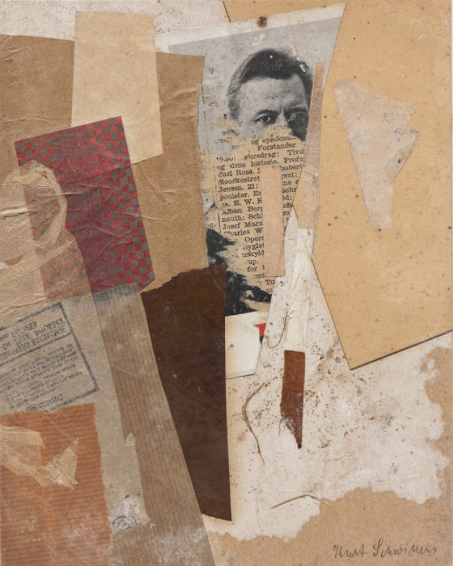 The materials used within the collages include basically anything that Schwitter could get his hands on that would work for the conceptual pieces that he created as he thought of them as just as useful as paint within the creation of art. He used many found objects and everyday materials to create pieces within different mediums including abstract collage, installations, poetry and performance which shows that he was not afraid to experiment between not only different materials or objects but also between different genres and types of art. The collages that Schwitter created show great creativity and understanding of what works together, and equally what doesn’t, along with an approach to art that I highly admire; experiment, experiment, experiment. When we see collages today we do not give them as much value, necessarily, as they would have in the time of new stages of the art form being developed because back then they were just that: new. Now when we look at collages they are associated with what you create at primary school in a mood board type style with cutting and sticking being the only skill needed. However, this is not the only skill required to create an effective montage/collage because to make it interesting it needs to be well thought through with the curation of the images and objects used being one of the most crucial things. Schwitter’s skills of not only selecting the pieces to use but also how he put it together would have been revolutionary in the time of their creation. This was just something that the Dadaists did; they revolutionised art. 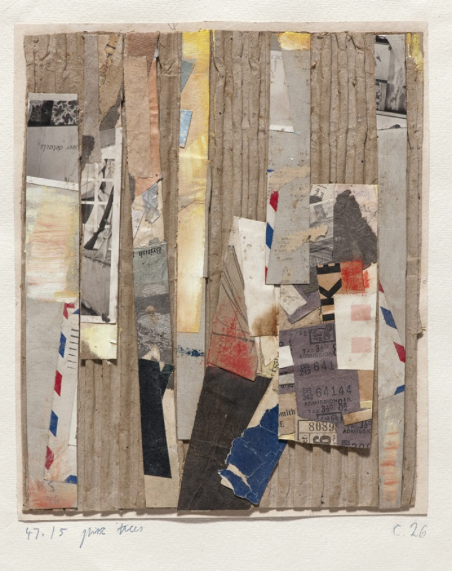 Collages were just one way in which they made art into something new and challenged the previously quite stoic rules that ‘beautiful’ art followed. I like the idea of using 3D objects as well as 2D images and paper cut outs because it is a way of showing nearly every aspect of something instead of just showing us pictures of it. I would like to use physical objects in my piece for this week’s task because I think that it is a good way to show not only images of things that make a person who they are, it also allows you to show the physical things that we use in our daily lives and the things that we hold dear to us which essentially tell people who we are. This project is something that I have always been interested in, not just because of the great concept, but also because of the clever presentation and layout of the book. I have created something very similar to this before by creating a series of images that were based around spirituality and then I experimented with them post print and then stuck them inside a bible to try and show the differences, and similarities, in religion and spirituality. This project opened up this presentation style for me and I have been using it ever since. When I saw this book in print in a library in Dublin I got to see just how impactful it is. The contrast between the idea of religion being a peaceful institution compared with the conflict in the images causes just that; a conflict. It allows us to see how the two ingrate and makes the viewer think about the binary subjects that are a regular subject in both the news and in everyday life. I think that the presentation method is a great way of creating a direct comparison as well as showing that two things are linked. I do, however, think that the method used by Broomberg and Chanarin of printing the images onto the actual pages looks a lot more professional and neat compared to when I have just stuck images into a pre made book. However, sometimes this can make the work seem like the artist is trying too hard to make them work together instead of showing them as exactly what they are; different. I think that using this method to create my montages would be a more interesting piece to look through compared to if it was a cut and stick style collage like that of Kurt Schwitter or Hannah Hoch as you can pick it up and look through it like you would a normal photo book; it would be almost as if you are reading the book of a person’s identity. For this week’s task I wanted to create pieces that portray myself and my mother. However, I didn’t want to create a traditional cut and stick montage like that of Kurt Schwitter as I feel that this can sometimes look a bit childish and I wanted to be a bit more creative. For my mother I used a copy of her favourite book, some of her favourite flowers pressed and some pieces of knitting that she made for me, along with family photographs that I asked my mother to pick from the family albums at home. I asked her to choose the images on what she thinks are photographs that mean something to her or that she thinks show a part of herself. I wanted her to choose the images because it meant that the images mean something to her instead of what I think shows her as a person. My mother is the most important people in my life and I chose to use her as my subject because I know so much about her and she is the person that I have learned everything from, and she is also one of the reasons that I love art and photography. I chose to create a montage within her favourite book, in the style of The Holy Bible by Adam Broomberg and Oliver Chanarin, because it is something that I have done very successfully before and I thought that it was a great way of showing not only the images but also using something to hold the images that also means something instead of just being a container. I put the photographs in a sort of chronological/thematic order to try and get a sort of narrative going within the book, however, there are some places in which this doesn’t work and I feel that some images would look better in other places. The images I feel are something that help with my concept because I believe that family makes you who you are and that the identity of a person is made up through everything you do and everyone that you meet and that family is one of the most important things in life as well as the fact that family makes you who you are. Family helps us to learn about both relationships and the world in general, we learn through them how to navigate the world and how to deal with nearly anything in life. The images, which are made up of old and new, show different stages of my mother’s life, to childhood, to present day. They go from formal, traditional family photographs set up in studios, to selfies with myself and my mother. I think that although this deterioration of tradition is quite sad, I also think that it shows how the world changes and how this affects both the relationships that we keep along with how we document. I started the book with an image of my nan because I thought what better way to start a book about my mother than with a picture of her mother? I didn’t think there was one. t didn’t spread out the images within the book to try and have the end of the book free for the piece to be carried on as my mother has new memories and creates new images. It will carry on just as she will. This part of the task has completely changed how I think about identity because it has allowed me to create something that shows who a person is without having to take a photograph of them. It has allowed me to think of new ways of creating a montage as well as trying to keep my concept interesting. The second montage, of myself, was not so successful. 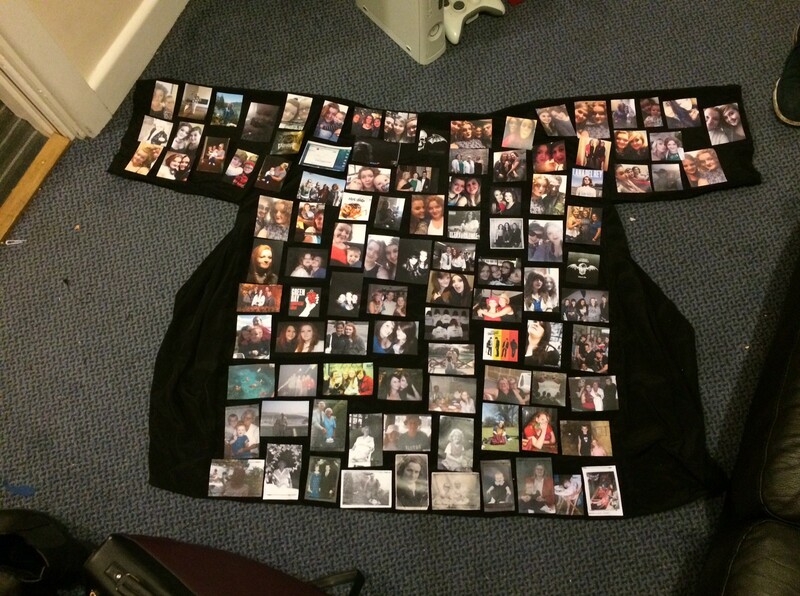 I made a kimono, which is something that I make quite a lot and is something that my mother taught me how to do, and sewed my chosen images onto it. I don’t really like the final result because it looks very amateurish and a bit sloppy/childish. I would have made a book for myself, however, I don’t really have a favourite book and I felt that if I just used a random book, it wouldn’t have meant as much as my mother’s. Some of the images are the same for both mine and my mother’s montages because of the fact that I have always spent time with my mother and have a lot of the same memories and important people in my life than she has so I thought it only right that the beginning of my piece was nearly the same as the end of her piece. I found it interesting that a lot of my images within the montage are modern ‘selfies’ and a lot of them are from after I moved out of my family home and my mother and started university. It is almost like my life had a sort of reboot when I moved away in the sense that I was allowed to make new memories with new people instead of relying on my mother to do nearly everything with me. I don’t really know what else to say about this piece because I am so disappointed with it and I would not even feel comfortable showing this as a final product as I don’t feel like it shows who I am at all. I would like to create a piece like this for the final product of this module, however, I would like to do something that shows not only my mother but also her 5 siblings so that you get a stronger sense of the ‘family unit’. However, I don’t know if this is completely possible because of the different, and not so close, dynamic that we have with some of my mum’s siblings since my nan passed away.